Loss and grief, pain and shock, anger and helplessness. These are all emotions that sweep over us as we see the pictures and hear the stories of the swelling refugee crisis in the Middle East and Europe. Loss and grief, pain and shock, anger and helplessness. These are all emotions that sweep over us as we see the pictures and hear the stories of the swelling refugee crisis in the Middle East and Europe. And none has been more heart-wrenching than the image of 3-year-old Aylan Kurdi’s body washing up on a beach in Turkey, his family having tried so desperately to reach safety as they fled horrific violence in Syria. A precious life lost that could have been saved. And today, he and his 5-year-old brother and his mother were laid to rest. The biblical concept of “lament”-- life-shattering sorrow comes to my mind and weighs on my heart these days. Refugees fleeing Syria need you. Act - In response to this global refugee crisis, the largest since World War II, you can urge the President and Congress to increase the annual refugee admissions goal, or “Presidential Determination” from the 2015 number of 70,000 to 200,000 for 2016 and prioritize receiving 100,000 Syrian refugees in this number. Pray - Pray for all refugees, Syrian refugees, young Aylan’s family as they mourn him and his mother and brother. Thank you for your prayers and lifting your voice in support of refugees seeking safety. P.S. 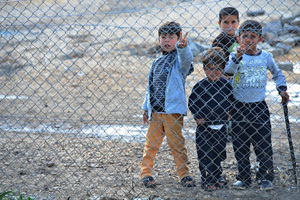 Support all refugees here, especially helping communities prepare to receive Syrian refugees by making a donation to LIRS today.